NetSuite CRM is a robust and powerful customer relationship management solution that boasts of providing companies complete 360-degree view of their customers in real time. Users enjoy a continuous stream of information from all points and throughout their customer lifecycle. With NetSuite CRM, companies are able to deliver exceptional customer experience from the early stages of lead management all the way to fulfillment and post-sales support. The platform offers users more than just traditional features most CRM systems provide. On top of the usual capabilities, NetSuite CRM comes with powerful and advanced functionalities marketing automation, sales force automation, and customer service management. 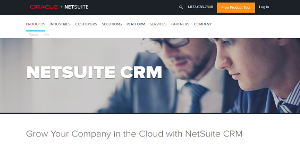 NetSuite CRM is a complete customer relationship management platform that incorporates traditional and advanced capabilities to help businesses drive revenue and growth. It comes with a robust set of features that include automated tools for partner relationship and marketing, and even conventional CRM functionalities like customer service management and SFA. Contact management is one functionality NetSuite CRM users find very useful to their business. Contact information, including their role within their company, communication history, and issues with your products and services are within reach. All customer interactions are laid out in a very convenient timeline and you can easily put to task your departments or individual team members to access your customers’ information and history. NetSuite CRM gives you the ability to track all activities your clients and visitors make on your website and imports all their data into the system. Even if you don’t retrieve personal client information, NetSuite CRM records all cyber paths they take, including the links they click and the pages they view. All data are then delivered to your sales team who then uses the information for marketing campaigns, lead generation, and sales forecasts. The software allows companies to monitor the productivity of their employees by tracking their workflow, task-completion ratio, and progress reports. NetSuite CRM incorporates a group calendar which is an excellent place for everyone to monitor their to-do lists as well show off their accomplishments once they are finished. There are well-liked and widely used applications in each software group. But are they necessarily the best fit for your organization’s specific needs? A popular software product may have thousands of subscribers, but does it provide what you require? For this reason, do not blindly invest in popular systems. Read at least a few NetSuite CRM reviews and think about the factors that you want in the software such as the cost, main functionality, available integrations etc. Then, choose a few solutions that fit your requirements. Try out the free trials of these apps, read online opinions, get clarifications from the seller, and do your research thoroughly. This in-depth groundwork is certain to assist you find the most excellent software platform for your organization’s specific requirements. How Much Does NetSuite CRM Cost? We realize that when you make a decision to buy CRM Software it’s important not only to see how experts evaluate it in their reviews, but also to find out if the real people and companies that buy it are actually satisfied with the product. That’s why we’ve created our behavior-based Customer Satisfaction Algorithm™ that gathers customer reviews, comments and NetSuite CRM reviews across a wide range of social media sites. The data is then presented in an easy to digest form showing how many people had positive and negative experience with NetSuite CRM. With that information at hand you should be equipped to make an informed buying decision that you won’t regret. A reliable business suite made for the future. A great system that does it all. A person who journeyed from admin to sales and back. Using NetSuite for the first time. Responsive team and an exceptional product. What are NetSuite CRM pricing details? What integrations are available for NetSuite CRM? Pros: NetSuite has the capacity to enable any kind of business. It does the same for employees within each organization. It served an easy approach when it comes to managing and gather info. It does so by making room for endless dashboard possibilities. Cons: I just want to say this bluntly: there's nothing that I hate with NetSuite. Their Gold support was fantastic. There's always an approachable and helpful person at the other end of the line. There are a few bugs that my company experienced. Someone even told me other organizations have experienced them too. But those are just small speed bumps during some working periods. Pros: After giving other POS, ECM and CRM software a go, I'm starting to miss NetSuite's all-in-one functionality. That's what so good about this system. It makes things a little easier for you. Rather bolting for a third party software and getting it work, NetSuite has everything in one package. Cons: I have no clue about the pricing details. But I've heard it's quite expensive. The other downside it has is that while it's a good thing to gain remote access online, it does run into issues from time to time. By then, we'd already be sitting ducks. We've made use of their live-to-web functionality. And that was a bad thing to do as it caused our site to run super slow for our customers. Links moving from record to another. Enter info for a wide range of records is easy. It has plenty of powerful offerings. Numerous options for relationship dependencies. An intricate program with great business capabilities. Usable and comes with good integration. A user of NetSuite CRM. If you need more information about NetSuite CRM or you simply have a question let us know what you need and we’ll forward your request directly to the vendor.